The JS63V is a dedicated mulching machine which delivers a premium cut without the need to manually dispose of clippings. The highly effective mulching system will save you time and effort. The JS63V make it easy to adjust speeds to suit you and your terrain. Overhead valve (OHV) technology supports optimal power and reduced fuel demand. With up to 25-degree slope allowance, it suits any application where operators still feel comfortable to mow. The variable speed provides a range of speeds that suit both tough and easy to handle conditions. The 533-mm (21-in.) deck is stamped of 13-gauge (2.28-mm (0.09-in.) steel, with a rolled lip for extra strength. 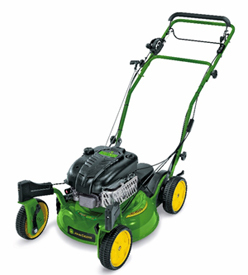 The mower deck is welded to provide a stronger assembly and eliminate fastener heads on the inside of cutting chamber. The dome design, combined with a special blade, provides superior cut quality and mulching performance in heavy or damp grass conditions. The smooth deck also prevents grass sticking and is easy to clean with broom or scraper.